MAPEX Property Showcase 2015 — the first property exhibition organised by the Real Estate and Housing Developers’ Association Malaysia (Rehda) Youth — got off to a good start, despite the less-than-ideal period in the property market. Rehda Youth is the youth wing of Rehda and has more than 100 members. 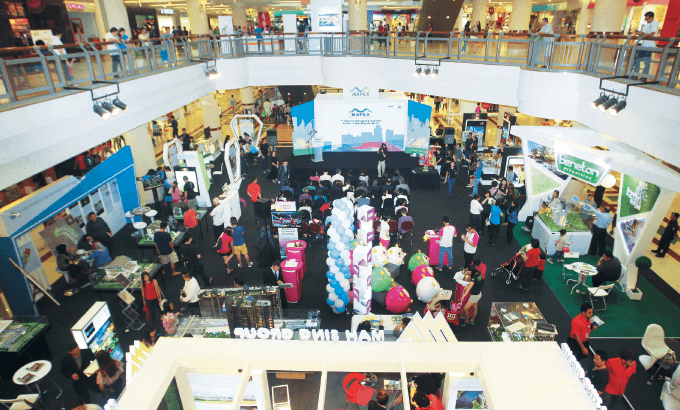 The exhibition was held from March 11 to 15 in three locations at 1 Utama Shopping Centre, Bandar Utama, and attracted over 10,000 people comprising families, young couples, investors and those working in nearby offices. A total of 30 developers took part in the exhibition, including Beneton Properties Sdn Bhd, KEN Holdings Bhd, KIP Group, Land & General Bhd, IJM Land Bhd, GCPG Group, Mah Sing Group Bhd, Paramount Property Development Sdn Bhd and S P Setia Bhd. Visitors were entertained with a number of activities sponsored by Rehda Youth such as the mascot from the popular Ben 10 cartoon, a princess lookalike contest, a colouring contest, an interactive gaming session and cupcake decorating classes. The exhibition concluded with a prize-giving session for the children’s colouring contest and a lucky draw event that saw five winners walk away with ONECARDs — the shopping centre’s membership cards — preloaded with points worth up to RM1,500. During the closing ceremony, Rehda Youth also donated RM50,000 to SJK (C) Puay Chai 2. At the event were past Rehda presidents Tan Sri Eddy Chen, Tan Sri Teo Chiang Kok and Datuk Ng Seing Liong as well as The Edge Communications Sdn Bhd managing director Au Foong Yee. The Edge Media Group is the media partner of the exhibition. Rehda Youth chairman Sam C S Tan says the cost of the activities was borne by the association. The exhibitors were only required to pay for booth space rental. “It’s a risk we took, to drive crowds to the mall, and thankfully it paid off,” he says, adding that the association was going the extra mile to make a win-win situation not only for exhibitors but also the mall. Tan says the shopping centre’s management was pleased with the higher number of visitors during the period and attributes the event’s success to support from the mall’s director Tan Sri Teo Chiang Kok. Although initial reports said the exhibition generated RM33.4 million worth of sales, Tan notes that real sales figures will only come in after two weeks or so. He also observes that there were many potential first-time buyers who are most likely from families living in neighbouring areas such Taman Tun Dr Ismail and Bandar Utama. Where will the next property showcase be? Tan says there are at least four planned, with two to take place in Tropicana City Mall in Petaling Jaya and Publika in Dutamas. “The next few events will have to be more boutique due to the smaller sizes of the venues,” he explains. Rehda Youth is currently planning the events to take advantage of the unique layouts of Tropicana City Mall and Publika, demonstrating that in tough times, the industry must still soldier on and merely making sales is not the bottom line. This article first appeared in City & Country, The Edge Malaysia Weekly, on March 23 - 29, 2015.